Swimming pool depth recommendations depend on many factors which eventually meltdown to a personal choice. Such factors may include users of the pool as well as how one plans to use the pool. The pool depth will affect the whole design process. This is why you need to consider a few factors for the optimal depth. The article below provides basic things to consider in determining the depth of your pool. What do you intend to do with the pool? Answering this question correctly will help you make an informed choice on the optimal depth. Swimming: When it comes to swimming, the water should be deep to offer a complete range of motion. This will ensure you don’t scratch your knuckles on the end when swimming. If you are passionate about swimming, then the recommended pool is swim spa measuring a depth of 3.5. Recreational Games: The water should be enough for recreational sports such as basketball. The essence here is to enable players to move with ease, stand as well as swim effectively. Preferably, the ideal depth should measure between 3.5-4 feet over a large area. The measurements should also be uniform for all players to benefit. Lounging: For cooling yourself, the ideal depth should be above your waist. This means the measurement between 3.5 to 4 feet on average. Most pools measure standard heights ranging from 3-5 feet. However, you should first consider your own height as well as your partner. For instance, the ideal depth for a man measuring 6’0 and a wife 4’0 should be 4 feet. The consideration factor here is the height of the shorter partner and not the opposite. Kids grow each day, unlike adults. This means there is no ideal pool depth for young children. For beginners, the recommended height should be 2 feet. As time goes by, the child will move to 3 feet and so on. Most people prefer an isolated wading pool for young toddlers. However, there is an option for those who want to integrate a wading pool with a standard one. You need to make an L-shaped pool accommodating both shorter and longer legs separately. Diving is a huge factor to consider when it comes to ideal pool depth. Any pool with a diving section should measure a minimum of 10 feet deep. However, diving may cost your pocket as well as the general design of your pool. You can have a pool with uniform depth all over the area. On the other hand, you can have one with multiple depths to serve your different needs. One idea is to get a pool with a one-sided shallow end and a deep slope of about 5 feet. The biggest determining factor on your pool height is the use you intend it for. A standard pool ranging between 3-5 feet is ideal for family use. 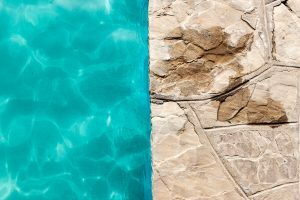 In addition, safety should be another priority when it comes to swimming pool depth recommendations.